Some years ago, I went up to the roof of a 26 storey building in Portsmouth to look at the view. Portsea Island, as you may know is quite flat and the dense blocks of Victorian streets stretched away to the east in my view in various patterns, mostly squarish. However, there was one area where the streets were not straight for different distances, but were formed in a series of large S bends. I cycled over to have a look at them but could see no physical cause. Old maps however showed the pre-housing pattern of fields and hamlets, whose fields when sold off to developers formed the boundaries of the next extensions of housing away from the old harbour and town centre. This included the block I had noticed, whose fields were indeed S shaped and I eventually found the reason in one of Richard Muir’s wonderful books about the landscape. I discovered that large, very square field shapes, whether in the open countryside or fossilised in town streets, were relatively recent, dating from centuries when land was enclosed by Parliamentary acts. These boundaries often themselves enclosed older fields, either whole or partly, which had been shaped by progressive clearing of ‘waste’ land or forests; these can be seen clearly from the air as shadows in fields when the sun is lower. 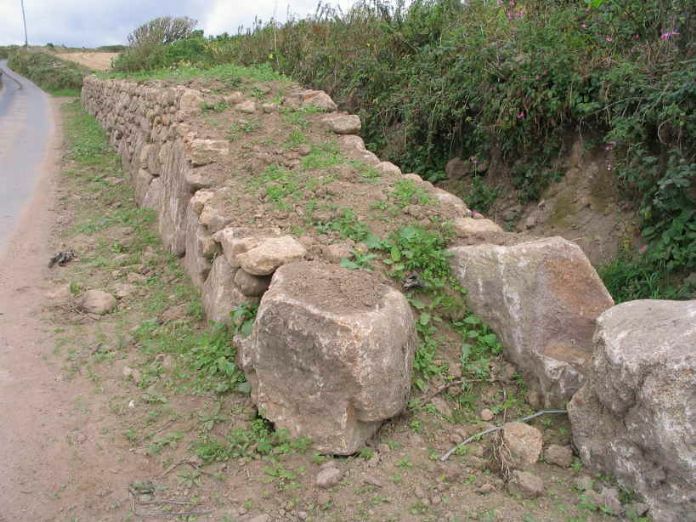 Bronze Age fields show up as small, slightly irregular shapes, although some are actually preserved as modern boundaries, which Jean Nankervis has shown in her history of Wicca, near St Ives. At first worked mainly by hand, the coming of ploughs drawn by animals speeded things up but required more turning space at the end of each long furrow and this was the cause of the development of the S bends. It was a faster work system but wasteful and is now rarely seen, although it is always worth looking out of train or coach windows to spot some. The physical boundaries themselves in the countryside are varied and interesting. In West Cornwall, the best source is Wildlife Revival in Cornish Hedges by Robin Menneer, 1994. No less than 21 types of Cornish hedge have been devised, the most common being the Cornish Hedge, the Cornish Stone Hedge and the Cornish Turf Hedge. If indistinguishable beneath growth, look for gateways, where the cross section may be clear. Note patches where a damaged hedge has been repaired or an old gateway has been closed – this will usually show up as stonework (or bricks) in a different pattern; this may indicate the transfer of a field between neighbours, so that different access is required. Original gateways will be smaller than those enlarged to pass modern machinery through. A length of hedge that has been completely removed, in order to combine two small fields, may be identified by observing the field after ploughing and tracing a line of soil containing more stones. All these details can help in deducing the succession of field boundaries. It is also worth looking at the hedge stones themselves; have they come from the original clearing of the field (classic examples in Lake District), from a nearby small farm quarry, or further (see previous piece on geology and local history)? A much publicised method of estimating hedges by the particular plants growing on it can help but is not necessarily accurate. In some areas, parish boundaries are shown by a double hedge although stone markers are more frequent. If the parish you are researching still does a walk around the boundary once a year, it is worth doing and noting how often field boundaries co-incide across a roadway (i.e. the fields are older than the road). Parish boundaries may show how the course of the original stream or river boundary has moved since the ancient boundary was drawn. Sometimes there may be a small piece of the parish quite separate from the main area; this can usually be traced to a marriage, where the wife brings land from a neighbouring parish as part of her dowry. In the Morrab Library, Penzance is an amazing map of 1841, showing how the modern Borough boundary was drawn with a compass, as a semi circle, with no connection at all to existing ancient field boundaries – makes an interesting study of local politics. Boundaries, of course, can easily be altered. Whole villages could be swept away by the building or extension of a large building such as a great house now accessible via the National Trust. Many built with slave trade money had no interest in ancient boundaries but were concerned with designing a great estate around their house and its views; a deer park might be created, either for real use (earlier) or as a status symbol (later). Sometimes the boundaries might be obvious, where the seriously rich provided large stone walls and grand entrances. On a smaller scale, there is a tiny footpath in Praa Sands, Cornwall, leading up a hill to a hamlet called Lower Trevurvus. Examination of the north hedge of the path reveals the deep ditch on the upper side, designed to keep deer in, and from this, together with modern aerial photographs, the whole layout of a small deer park can be identified. As described in Portsmouth, as hamlets expanded to villages and villages to towns, the fields disappeared, but careful observation can soon find their traces and the local historian should never rely totally on documents and old maps. These have often been drawn or written with a purpose and there may be errors and omissions. Research should always be backed up by constant observation. To quote from some graffiti that I have seen on a new building site – ‘The fields lie sleeping underneath’.